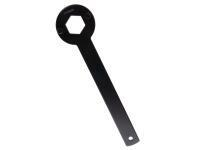 Tool for removing the clutch bell and loosening the large nut under the clutch bell. This tool is required for work on the clutch, the rear shifter and the compression spring. Tool width: 34mm. Separation of bolts: 58mm (measured from bolt centres). For assorted 50cc Piaggio and Gilera scooters like the Typhoon, NRG, Runner or Pure Jet models. Please check the tool size required for your clutch nut before ordering.